There was great enthusiasm around here about the prospect of an Emmy Cooks bloopers reel, so today, for your enjoyment, I present a dish that didn’t turn out so well. 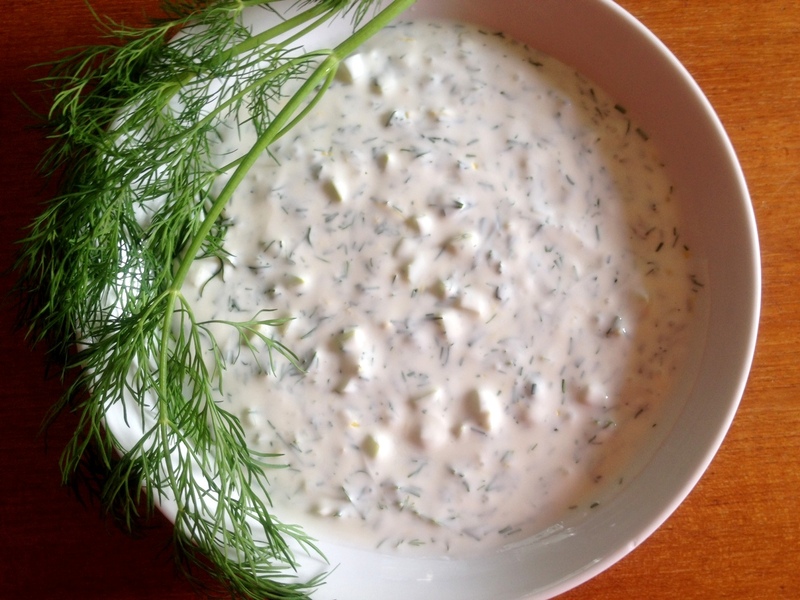 To be clear, I love the tzatziki recipe I’ve given you below–you can’t really go wrong with herbed yogurt sauces in my book. 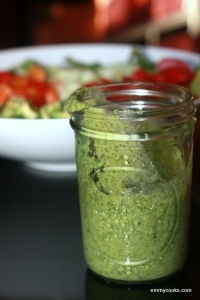 Remember that cilantro yogurt sauce (and are you still making it as often as I am)? 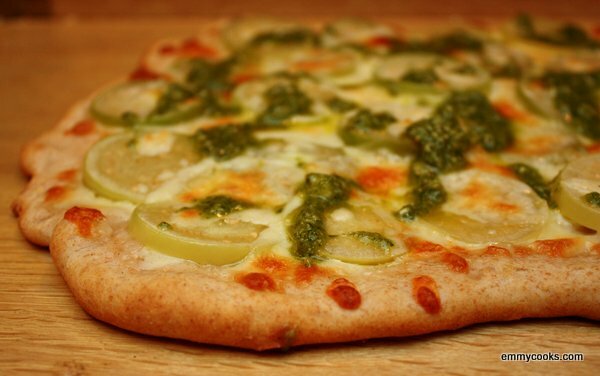 The basil yogurt sauce? This, finally, is the classic: yogurt and dill, with cucumber for crunch. And it’s great. But I made the tzatziki as one component of an apparently ill-conceived riff on Eggs Benedict, which ended up not as great as it should have been. It was good, but…. 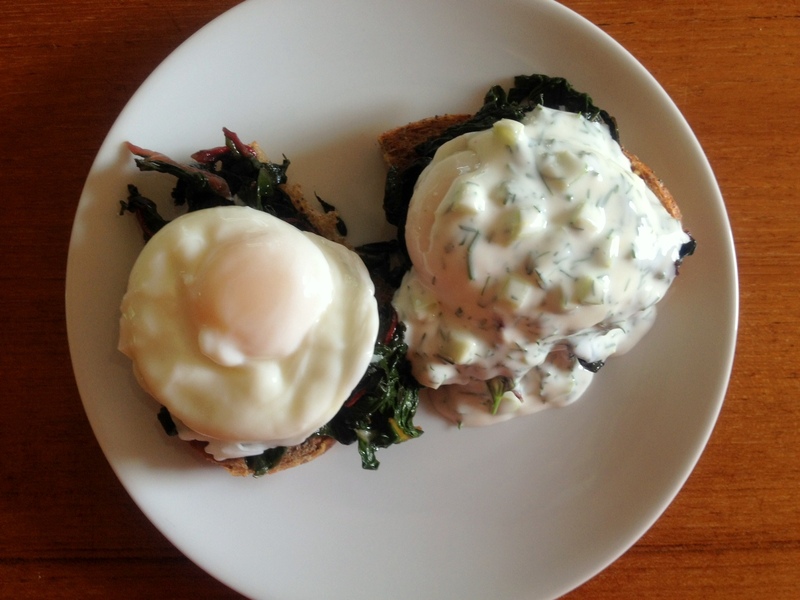 It was whole grain toast topped with silky sauteed chard, a poached egg, and this lemony-garlicky tzatziki, but it needed a little something more. A drizzle of spicy butter? A generous crumble of smoked salmon? You tell me if you try. I’ve already picked out a recipe from Ottolenghi’s Plenty for the next time I try an eggs-and-yogurt combination. Unfortunately, I made this breakfast for my sister, thinking it would be a special send-off meal after two so-nice weeks together. I was sad to say goodbye to her, but what a luxury to have so much time together when we live in different cities. Thank you for coming, sis, and for all the fun and help! Next time I will play it safe and express my breakfast-time appreciation with chocolate waffles instead. The consolation prize is having a bowl of the tzatziki in my fridge to enjoy in the coming week. This entry was posted in Food, Recipes, Sauces, Snacks and Apps and tagged CSA recipes, cucumber, dill, dip, sauce, summer, summer vegetable recipes, tzatziki on July 14, 2012 by emmycooks. This one is a beaut. 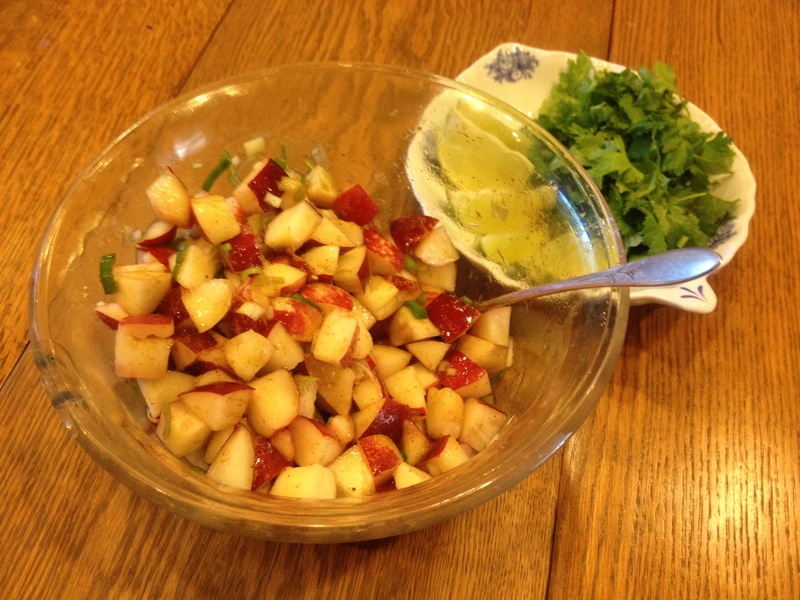 I think that my love for radishes has been well documented here, and when I saw this Smitten Kitchen recipe I was pretty sure that a radish-less version would be a pale imitation. But in a very unusual turn of events, my fridge is relatively bare (we were out of town for 10 days and I haven’t gone shopping yet). The only crunchy vegetables I could scare up were romaine lettuce, a yellow pepper, a few baby carrots, and a couple of green onions. 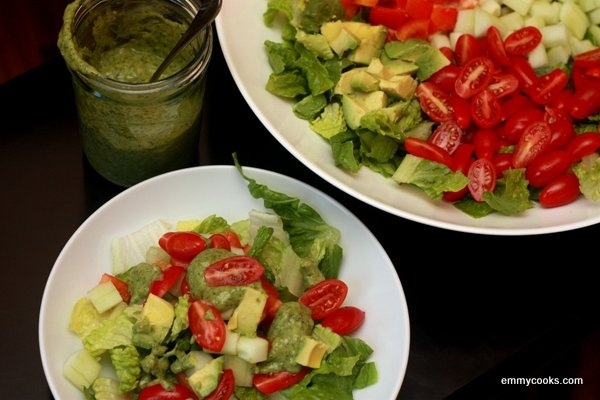 Into the salad they went. 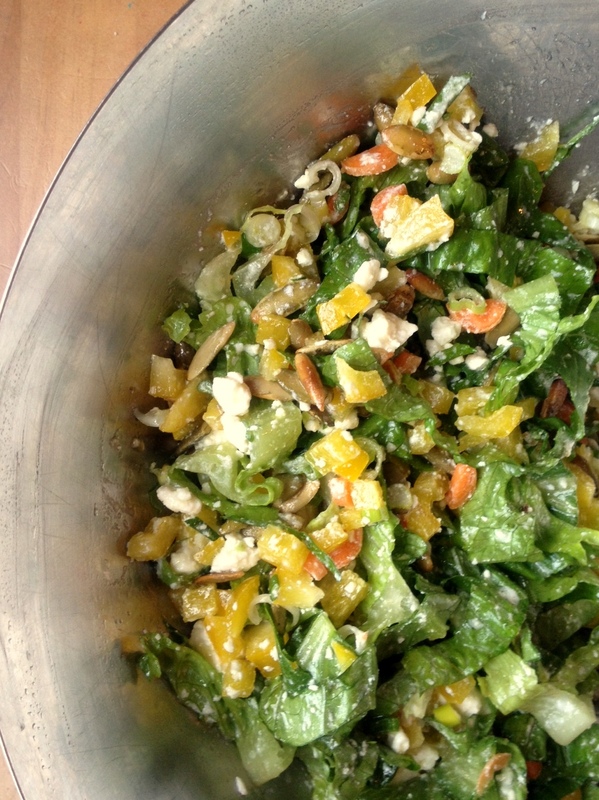 This entry was posted in Easily Multiplies to Feed a Crowd, Food, My Favorite Recipes, Recipes, Salads and tagged 4th of July, gardening, make a salad today!, potluck, summer on July 3, 2012 by emmycooks. Why yes, those are chocolate pancakes you see pictured below. A certain three-year-old daughter of mine is about to turn four, and she requested them for the birthday pre-party we had today. (Last year it was chocolate waffles.) We like to draw birthdays out as long as possible in our family. While chocolate pancakes might be unconventional, they were topped with the most natural pancake topping I know for this time of year: a berry sauce. My parents grow blueberries, raspberries, and multiple varieties of blackberries that bear fruit throughout the summer. My kids’ hands and shirts have been stained with berry juice since the day we arrived, and every day there are fresh baskets of berries waiting after my dad makes his morning rounds. This berry sauce, one of my mom’s specialties, was inevitable. 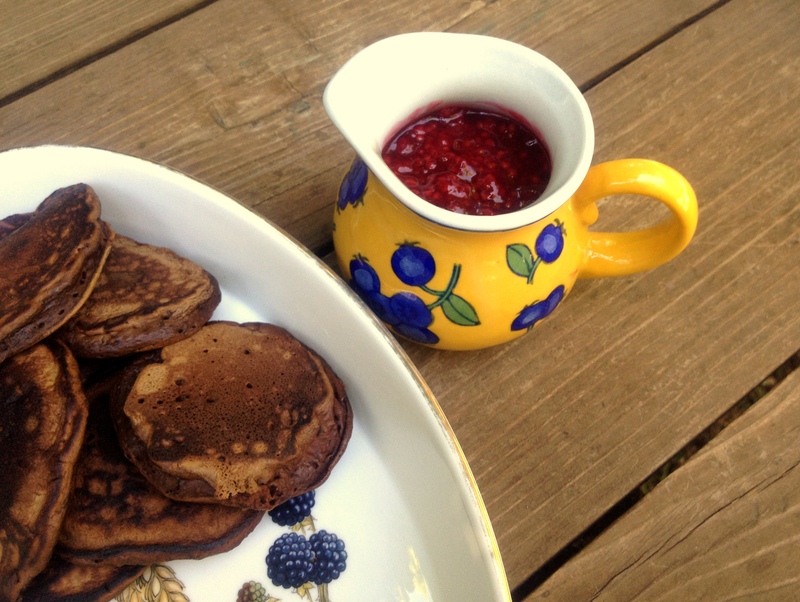 This entry was posted in Breakfast, Easily Multiplies to Feed a Crowd, Feeding Kids, Food, Fruit, Recipes, Vegan or Would-Be-Just-As-Good-Vegan and tagged berries, child's birthday, pancake sauce, summer on June 29, 2012 by emmycooks. Seattle being Seattle (read: located above the 47th parallel), we are expecting almost 16 hours of sunlight on the summer solstice this week. These long hours of light don’t always herald summer’s arrival, though. We usually say that summer starts after the Fourth of July in Seattle. We hope. You know what else doesn’t start until July? My CSAs. Yes, that’s right, plural, CSAs. Two big boxes of gorgeous produce–one mostly fruit and the other mostly veggies–for twenty weeks. I can’t wait. For those of you in the Seattle area who haven’t thrown your lot in with a CSA yet, there are lots of great options in our area, but I truly love the two that we are getting this year. The first is from Tonnemaker’s organic farm and orchards, which provides a weekly box of unbelievably fragrant and impossibly delicious summer fruit: cherries, apricots, peaches, melons, pears, and apples were some of the highlights last year. They grow many varieties that I had never heard of, let alone tasted, and a few months of their fruit was enough to make me truly mournful about having to get through the winter without it. Tonnemaker’s is located in Eastern Washington, so they also provide some of the hot-weather produce that we’re starved for on this side of the Cascades: Tomatoes! Eggplants! Peppers! The other CSA, our old standby now, is Nash’s Organic Produce. They’re located out on the Olympic Peninsula, but they deliver to a few Seattle farmers markets. Nash’s hooked us years ago with the Sweetest Carrots I Know, then reeled us in with greens galore and broccoli that tastes like a different vegetable from what you buy in a store. Nash Huber and his team are also known for their activism and innovation in environmental conservation and protecting farmland, for which Nash received the 2008 Steward of the Land award from the American Farmland Trust, so that’s nice too. Of course it’s not too late to sign up for either CSA! Just click those links above (or–you’re so lazy!–click here for Tonnemaker’s and click here for Nash’s). 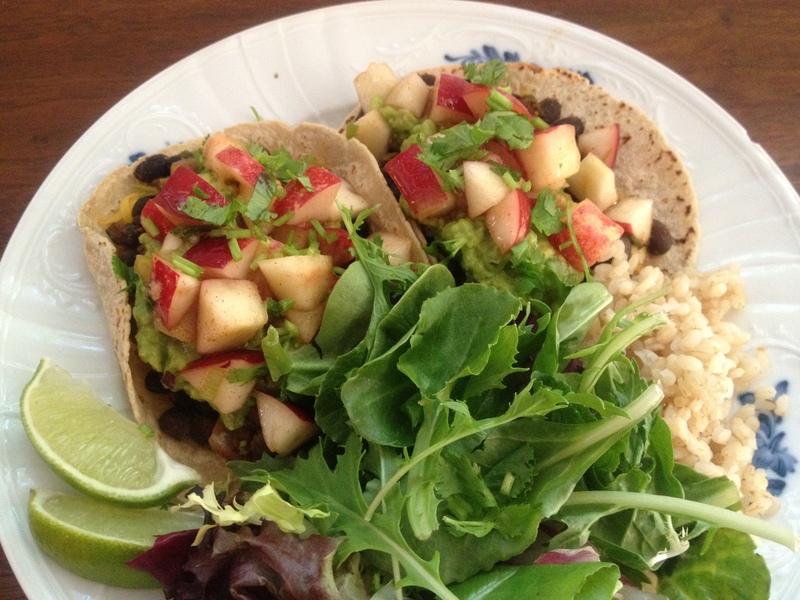 And once those boxes start rolling in, we’re going to be in veggie heaven around here. In anticipation of summer vegetables, I grilled a couple eggplants based on this recipe from Food and Wine that my mother-in-law recommended. I could have eaten the marinade with a spoon, but it was quite subtle in the finished dish, so if you want to take the easy way out you could just sprinkle the eggplant with olive oil and salt. 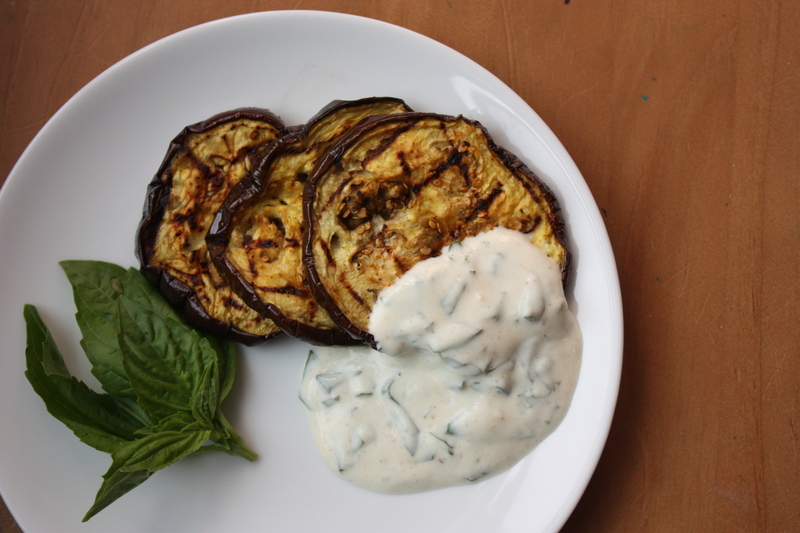 Most of what you’ll taste here is the smoky eggplant and cooling yogurt sauce with a background of cumin and big, herbaceous basil flavor as you crunch into the torn leaves. In other words, it tastes like summer. This entry was posted in Food, Grilling, Recipes, Vegetables By Themselves and tagged basil, csa, eggplant, grilled vegetables, lifestyle, outdoor living, summer, yogurt on June 19, 2012 by emmycooks.